As one of the most controversial Looney Tunes cast members, Pepe Le Pew is a study in what not to do. As a character, Pepe never enjoyed the overwhelming success that many of his co-stars found; women’s rights groups and concerned parents alike have found him distasteful enough to diminish his appeal as a cartoon superstar. 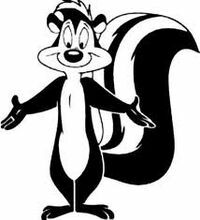 Here are ten of the valuable life lessons that children can learn from a Pepe Le Pew short or two. It’s Not Nice to Make Generalizations – One of the many complaints that the Pepe Le Pew shorts have met over the decades is the generalizations and stereotyping of France and French citizens. From his womanizing ways down to the way he speaks, Pepe is a perfect example of this politically incorrect behavior. Self-Awareness is a Good Thing – In his constant search for love, Pepe is most often foiled by his inherent but horrible odor, and his seeming unawareness of his effect on those around him. Pepe is consistently ignorant of how unwelcome his advances are; kids watching the antics of this malodorous gentleman can absorb the importance of being self-aware. Romance Can Be Tricky – When kids become teens, they will carry with them the lessons they’ve learned about relationships, however ill-formed they may be. From watching the classic cartoons starring Pepe and Penelope, kids will learn that relationships can be quite tricky. “No” Means No – The absolute refusal to accept Penelope’s lack of romantic interest in him is one of the most controversial aspects of Pepe Le Pew, and is often cited as one of the reasons he’s come under such fire over the years. The very valuable “no means no” lesson is one that’s taught very clearly in his clips, impressing upon kids the importance of treating a potential love interest with respect. Objectification is a No-No – Because she’s incapable of speech, the character of Penelope the Cat is defined only by her species and her penchant for running from the persistent Pepe. As a result, Pepe Le Pew is chasing an objectified version of a woman; he pursues her only because he finds her physically attractive, never even realizing that she’s not a skunk as well. Gender Roles Can Be Challenged – Watching the very rigid representations present in the Pepe Le Pew cartoons can open a strong dialogue about gender roles and the way that they’ve changed over the years. Children can learn that though there was once a time when women weren’t expected to make the first move, things have changed over the generations. Being Desperate to Fall in Love Can Get Messy – Pepe Le Pew’s only goal in life is to fall in love; he’s so desperate for a relationship of any kind that he’s resorted to doggedly chasing a female of another species that is clearly disinterested. Instead of taking the time to get to know Penelope, Pepe opts to chase her around the city in hopes that she’ll give in and love him back. Cheaters Never Win – In Pepe Le Pew’s introductory short, audiences learn that he’s actually an American-accented family man with a wife and children at the end of the film. Any sympathy that audiences felt during the short is immediately dissolved, leaving kids with the correct impression that cheating and lying are no way to gain respect. Good Hygiene is Essential – Much of Pepe’s problem with the ladies could have been avoided with a bit of attention to his hygiene; Penelope isn’t attracted to him primarily because he smells terrible. From this, kids can learn the importance of cleanliness and personal pride. The Tables Can Turn – In the 1949 short For Scent-imental Reasons, everything that audiences knew about the Pepe Le Pew universe is turned on its ear when Penelope finds herself irresistibly attracted to a suddenly disinterested Pepe. The lesson that the tables can turn is a valuable one for audiences of all ages. Sometimes it is these negative lessons that can stick with kids even better than the positive approach of what you ‘should’ do.